Standing from left are Dr. Andra Johnson, SU Ag Center Vice Chancellor for Research; Terrence Marshall, honoree for the area of Extension; Dr. Gary Simon, honoree for the area of Teaching; Dr. Calvin Reuben Walker, Interim Chancellor-Dean of the SU Ag Center and the College of Agricultural, Family and Consumer Sciences and honoree for the area of Research; and Dr. Dawn Mellion-Patin, SU Ag Center Vice Chancellor for Extension. Baton Rouge, La. – The Louisiana Living Legends Banquet was held on the evening of March 15 in the Felton G. Clark Activity Center on Southern University’s campus. The annual banquet is held as a part of the Louisiana Small Farmer Conference and honors individuals who have made significant contributions to Southern University in the areas of teaching, research, and extension. Alisa Welsh, Principal of Madison Preparatory Academy, served as the keynote speaker for the banquet. 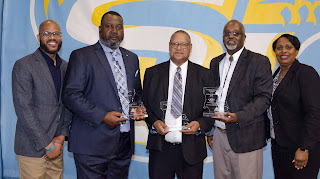 The 2019 honorees were Dr. Gary C. Simon, Southern University Veterinarian and Professor of Animal Science (Teaching); Dr. Calvin Reuben Walker, Interim Chancellor-Dean of the Southern University Ag Center and the College of Agricultural, Family, and Consumer Sciences (Research); and Terrence S. Marshall, retired County Agent for the Southern University Ag Center (Extension). The legends are nominated by the faculty and staff of the SU Ag Center and the College of Agricultural, Family and Consumer Sciences and selected by a vote of members on the Louisiana Small Farmer Conference committee. Nominations are open to anyone in the agricultural and food sciences with ties to Southern University, not just alums. The banquet was created in 2005 by Dawn Mellion-Patin, Ph.D., Vice Chancellor for Extension and Zanetta Augustine, Extension Associate, both with the SU Ag Center. To date, 30 individuals have been honored with this recognition. Photos from the banquet are available here.